“I don’t have time to make the meetings anymore” is a line I have heard often during my term as President. Let me offer these ideas, as an alternative to attending the club’s usual noon meetings. Our new Rotary Grill food trailer sells brats and hot dogs at every 4th Friday in Uptown and it is great fun to staff the food trailer! You can work a short 2-hour shift or the entire time the Rotary Grill is open. Be sure to bring a hat to wear. We have updated Interact Clubs for students at our local high schools. Dave Read has a list of careers the Westerville Interact members want to hear about and you could be that special person. Ask Dave how you can help mentor one of our students. Star House is our newest club partner. Give Mike Valley a call and commit to make a pledge to assist with our building project. Our club member, David Merrick, helped them design a new staff bathroom and shower area that they desperately need. We are also helping out at Star House on Saturday, May 12th. Let Ellen Cathers know you are free to help begining at 9 a.m. Many hands make light work. The annual Fourth of July holiday is right around the corner. From our morning 5K to the afternoon parade and evening fireworks, we need all hands on deck for the Rotary Cub of Westerville Independence Day Celebration, plus the hands of your family too! We also host a festival at Westerville South after the parade until the fireworks, featuring live music, great food from several food trucks, bouncy houses for the kids and lots more ways to enjoy our Westerville community. We will need all of our members to help make the day a success as we lead the community’s celebration of America’s birthday. So here are four easy ways to be active in your Rotary Club of Westerville. The club is so much more than lunch on Thursdays at Villa Milano. Get involved. Be more than a member that just pays dues. I promise you won’t regret the time spent on any of these projects. 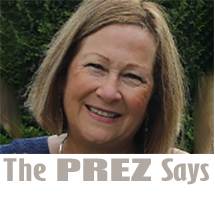 Lisa Janszen is the 2017-18 President of the Rotary Club of Westerville.